We, the BM group, are kick starting yet another Mega Marathon where we would blog all through the month barring Sundays. Each week we will all showcase recipes under a different category. 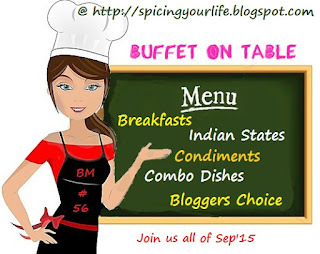 This first week is all about Combo Dishes across the world. We are aware of so many typical combos in our own cuisine, right? Like Pulao-Raita, Puri-Sagu etc..So let us explore the world to dish out more combos..
For Day 1, we travel down to Lebanon and get a taste of their ever popular Mujadara which is often served with a yogurt based condiment. I have chosen Cucumber Laban. I found that Mujadara is a very forgiving yet simple and comforting lentil based dish, very similar to our own Ven Pongal. In many versions, I have observed the usage of rice and lentils but I found this version where they use Bulghur instead of rice and that is what I used too. In a heated pan, add oil and fry the onions until they are caramelize (turn brown in color). After the pressure is released from the cooker, mix the Mujadara and mix half of the caramelized onions into it reserving the other half for garnish! In a bowl, add yogurt, chopped cucumber, salt, pepper, garlic powder and dried mint. Mix and serve it along with Mujadara for a filling meal. Such a comforting food .Nice way to start the race Harini! Nice combo and a healthy one I might add. You managed to put together a nice combo in a short notice, I mean the confusion with the themes . Delicious and lovely looking Lebanese dish. Wonderfully prepared. This looks absolutely inviting. Great start to mega BM. Fantastic start Harini, I have this bookmarked, yet to make it though..now I have more reasons to try! This dish is on my to do list after seeing it Food#52, looks simple and delicious. Harini , this is a combo that my hubby would love, its so much similar to our khichdi dahi , bookmarking ! Super combo and a wonderful start. Like Vaishali says we will like it. We meaning the sane rational adults ;D the other is not sane adult and the last is not even a adult!!! I love this mujadara. Definitely making it soon. am loving the earthiness and simpilicity of this dish... yummy start to the marathon.. Absolutely irresistible combo..Mujadara looks absolutely nourishing and satisfying..Cant take my eyes from that Laban. That's a wonderful start to BM. I have prepared both the dishes before and love that mujadara to the core. Simple yet flavorful dish. This is such a simple, yet delicious & comforting dish. I made this for a previous BM and absolutely loved it.